India is a developing country with an agro-based economy. Around 70% of the Indian population lives in villages, which still lack basic facilities such as clean water, electricity, sanitation, etc. Another critical problem seen in rural areas is the problem of staying healthy, which depends on the quality of food consumed. Since rural areas cannot afford sophisticated methods of food preservation, other sustainable ways need to be thought of. Fortunately, there are innovative devices such as “Food Preservator” that can minimize the difficulty faced by rural folk in storing edible, perishable items. In ancient times, earthenware pots were used to preserve food and cool water during the Indus valley civilization. 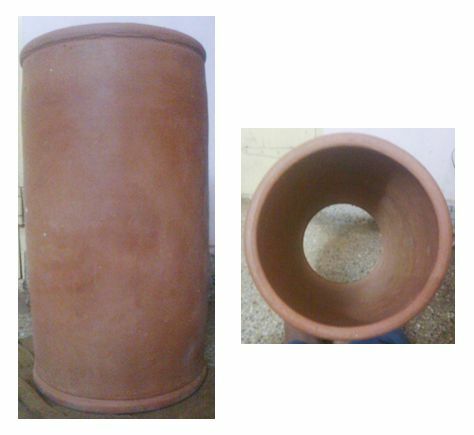 This earthen food preservator named ‘Zeer’ works under the principle of evaporative cooling refrigeration that does not require any external energy. A Zeer is constructed by placing a clay pot within a larger clay pot with a layer of wet sand in between the pots and a wet cloth on top. Evaporation of water from the outer pot draws heat from the inner pot; thus, the device cools as the water evaporates, allowing refrigeration even in hot, dry climate. It must be placed in a dry, ventilated space for the water to evaporate effectively toward the outside. A few Biotechnology students from R.V. College of Engineering, Bangalore (RVCE) were interested to design an apparatus that is innovative, eco-friendly and more importantly something that would help the rural folks to preserve food for longer time. Their project was one of the 35 shortlisted projects for the All India Young Engineers Humanitarian Challenge (IEEE AIYEHUM 2011). Inspired by the age-old techniques such as Zeer, RVCE students created a modern food preservator that works with the principle of evaporative cooling refrigeration. The preservator does not use any electricity, uses water as a coolant and is made up of non-polluting materials that are easily available to rural folk. The preservator is of 43cms height and has a base width of 31cms. The outer cylinder has pores of diameter 1.6cm and the inner cylinder has pores of diameter 0.6 cm. The space between the two cylinders is 5 cm. The skeleton of the entire device is made of aluminum. As the cylinders are too long, there is difficulty in packing filler materials. If the temperature is high outside, we can bring about a maximum difference, but if the outside temperature is cool, very less temperature difference is seen. Water could stagnate inside the inner cylinder. 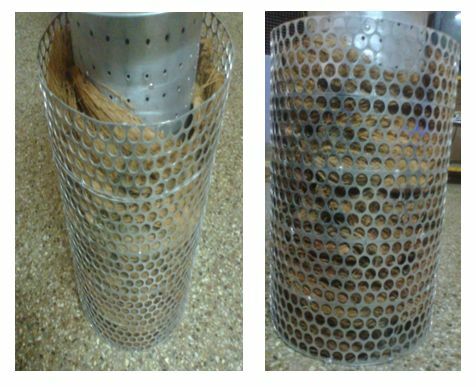 Suggested solution was to reduce the length of the two cylinders by 8cms, so that the height and base width will be proportional and also help in easy packing of filler material. 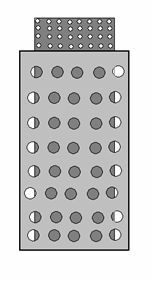 Perforations can be made at the base of the cylinders to allow water evaporation. However, such evaporative coolers tend to perform poorly or not at all in climates with high ambient humidity, since the water is not able to evaporate well under these conditions. This preservator can be improvised by using other filler materials for checking other factors such as water retaining capacity, antimicrobial activity to prevent decaying of vegetables and fruits. Few bryophytes (mosses) can be used as a filler material to provide antimicrobial activity. Using recycled materials for skeleton of the preservator would bring down the cost too, as the target audience belongs to lower middle class. Thus, this preservator has multiple positive impacts beyond the simple ability to keep food fresh for longer periods of time and reduce the instances of food-related diseases. Farmers will be able to sell their produce on demand and can command higher prices, women can sell food directly from their homes, rural employment opportunities can be created as people can start producing this preservator in bulk too. Fresh out of college, Shwetha Kamath is all set to explore the world. While pursuing Biotechnology Engineering, she indulged in scores of experimental activities and was given the honor of leading a funded project sponsored by IEEE. She has also been an active member of various NGOs such as Students in Free Enterprise, India Water Portal and India Innovation Labs. From an ecological standpoint this makes one of the optimally feasible alternative to the standard refrigeration system. Whilst majority of the conventional systems functions on refrigerants which can be considered potentially hazardous in one way or other , the methodology above illustrates best use of commonly available resources to construct an analogous system at fraction of a cost. Kudos to the research team ! Thanks Karthik, we do have simple and cost effective solutions like this but these should be popularized.